Estuary Program staff and volunteers work on a variety of projects that help the bay. Many people know about our work to help restore eelgrass to the estuary, our efforts to repair rural dirt roads to prevent sediment runoff, and our decades-long volunteer monitoring program that collects extensive data about water quality in our bay and creeks. Fewer people are familiar with the Estuary Program’s work to help dog owners put their pets’ waste in the trash, where it belongs. Mutts for the Bay dispensers make it easy to pick up after your dog to help keep our waterways clean. This is an important part of fulfilling the Estuary Program’s mission because keeping dog poo off the ground means that the bacteria it contains won’t wash into the bay each time it rains. This might seem like a small thing, but dog waste contains twice as many bacteria as human waste and can stick around for a year. That means up to 365 days of shedding bacteria that can wash across green spaces, down trails, sidewalks, and streets, and flow into the stormdrains that lead right to the bay. Yuck. Most people know that picking up after their pets is important, but it can be a hassle to keep bags stocked and at the ready. Our approach is to make picking up as easy as possible with our Mutts for the Bay program. 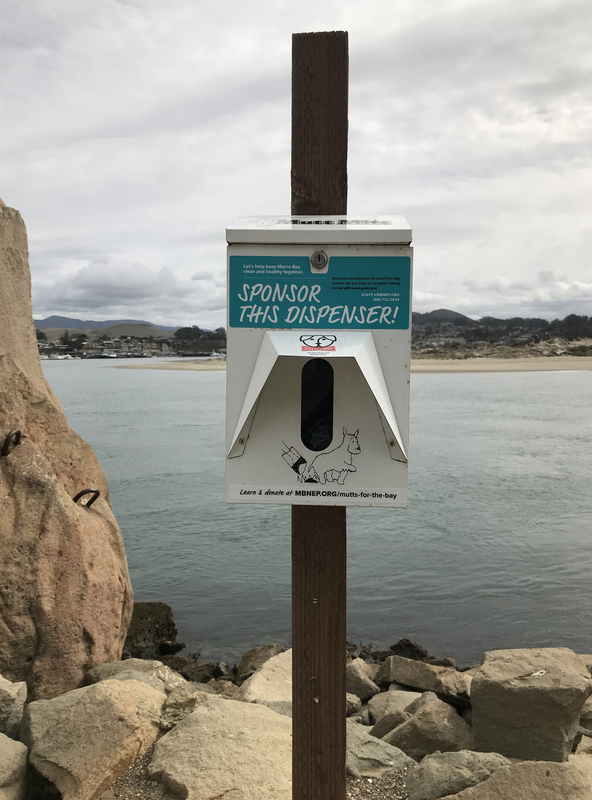 Mutts for the Bay provides free dog waste bags through 26 dispensers in Morro Bay. 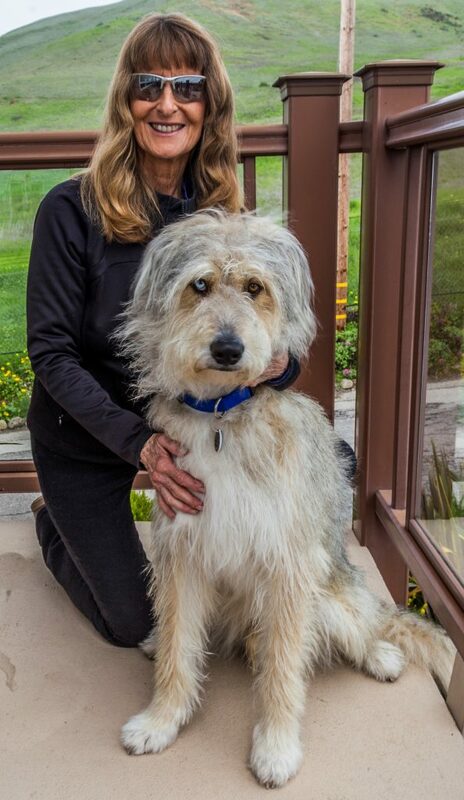 Karen and Rickey are long-time supporters of the Mutts for the Bay program. Our Communications and Outreach Coordinator, Rachel, had the pleasure of meeting them and their adorable dogs along the Harbor Walk recently. 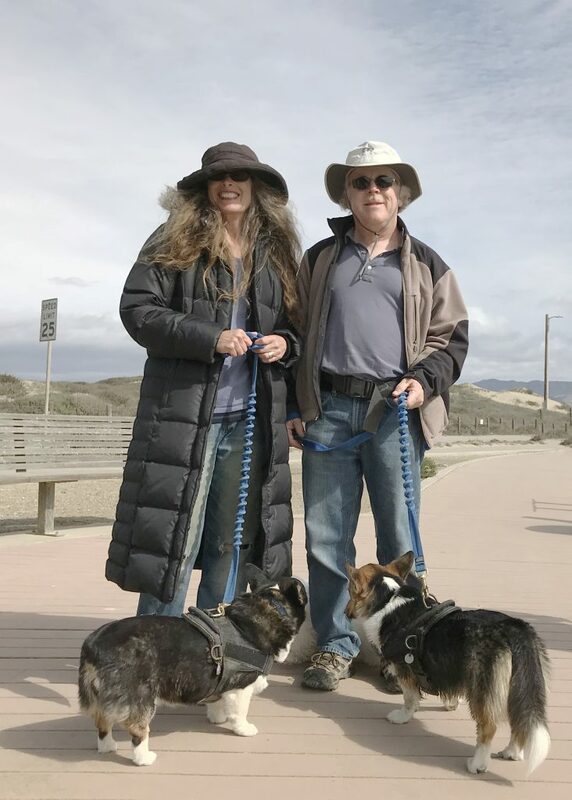 Thank you, Karen and Rickey, for your generous support and your commitment to keeping Morro Bay both dog-friendly and clean! 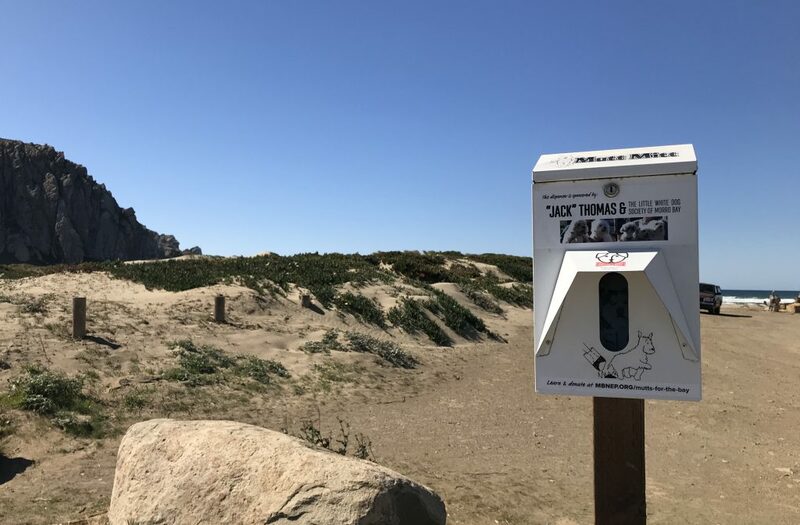 This year, we’ve created a Google Map that displays all 26 Mutts for the Bay dispensers, as well as dispensers managed by California State Parks, and other organizations. 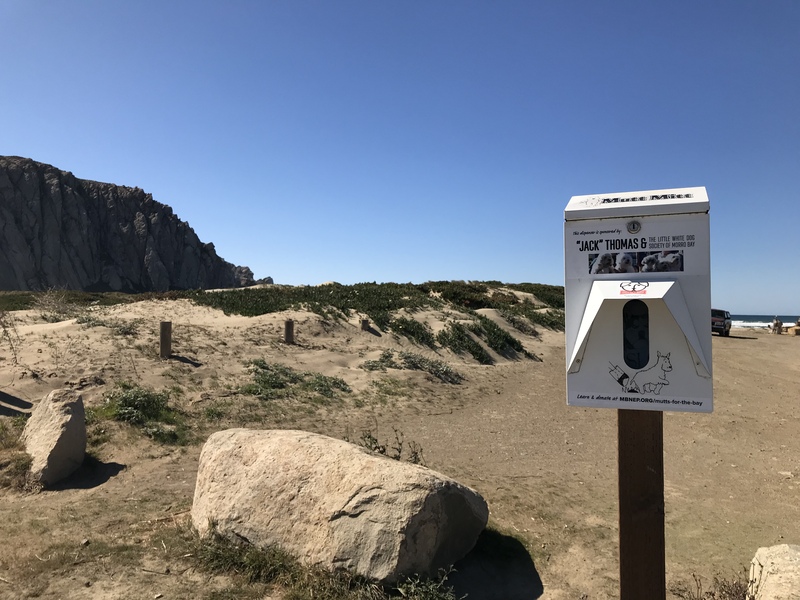 This way, no matter where you are when your dog’s duty calls, you can use your smartphone to find the nearest dispenser and do your duty to help keep the bay clean. 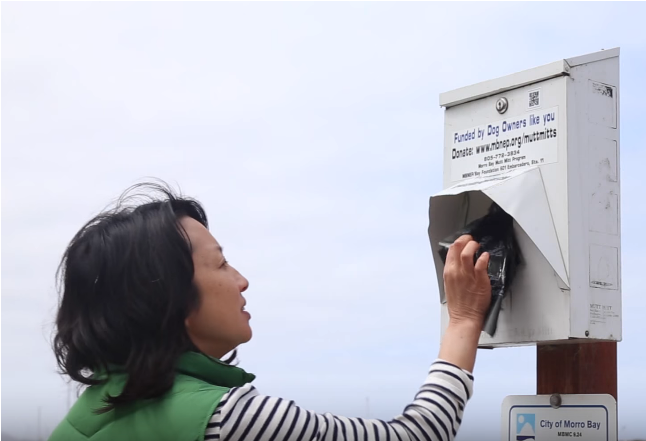 This program is a partnership between the Estuary Program and the City of Morro Bay, which purchases a portion of the dog waste bags used each year. This Mutts for the Bay dispenser right by Target Rock is still available for sponsorship. These dispensers have made a big impact. In 2017, locals and visitors used more than 380,000 bags to pick up after their pets. That’s 380,000 dog poo piles—literal tons of pet waste—that have ended up in the trash instead of the bay. That means we owe 380,000 thank yous to the people who chose to do the dirty work of picking up after their pets to help keep Morro Bay clean. Thank you! We show our thanks for each sponsor with a custom sticker on their dispenser. This dispenser at the Morro Creek Bridge is sponsored by “Jack” Thomas and the Little White Dog Society of Morro Bay. They may be our fluffiest group of sponsors to date! Pick up after your dog whether you’re at home, at a park, on the beach, or around town. You can use your own bags or use the free Mutts for the Bay dispensers. Help support the Mutts for the Bay program. You can donate online, send a check, or stop by our office. If you’d like to sponsor a dispenser, we can help you fill out the form and design your sticker. If you live in San Luis Obispo County, own a dog, and want to help keep the Morro Bay estuary clean, keep an eye out for opportunities to volunteer with Mutts for the Bay this spring. We’ll have more details soon!